Two vibrant hues of glowing green create an eye-catching, yet unobtrusive look for every envelope you send out. The simple white curve between the two tones provides unique aesthetic appeal that makes your mail stand out from the rest of the pack. It's a great way to show your sense of style, but the best part is how it makes your life a little easier. Forget about the headache of writing your return address by hand on all that outgoing mail. These self-adhesive return address labels eliminate a tedious task once and for all! 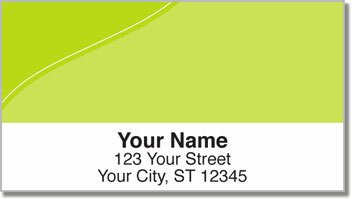 Get your own Green Curve Address Labels today! Not a fan of the green? We also offer this style in several other color options.